There’s this trap you can fall into where you believe that once you have something, you must always have it. The truth is that if a feature isn’t serving your community in a meaningful way, you should get rid of the feature. I recently closed and archived the photo album on a community I manage. Why? Because people stopped using it and started posting photos in the conversations they were having in the forums. Which makes more sense, really. Good bye, photo album. I have no reason to try to force people to use you when sharing pictures in conversations works so much more naturally. Keeping the feature would only disrupt that natural flow and spread the picture-related activity thinner, between two sections. Speaking of spreading things thin, your community contributions are likely broken up into different categories. As activity warrants, you adjust the way those contributions are organized and add new sections. That’s good. But again, just because you add one doesn’t mean you keep it forever. Even if you try to focus on big topics and not trendy things that will predictably pass, there will be an ebb and flow that may lead to a particular section drying up. If that trend is expected to continue, you have a perfect opportunity to merge that section with another one and move those contributions to an area where they will receive more attention. Having too few sections makes them too noisy. Having too many makes them too quiet. Instead, you want to keep it in the middle and that means cutting them from time to time. I don’t really believe in a hard-and-fast moderator:user ratio. With paid staff, you can expand as your budget and needs demand it. But with volunteer staff, you should take as many truly great people as you can. If that means that you have no one, so be it. If it means you have a lot of people, all the better. The point is: you want the best of the best. Having the biggest team isn’t the point. Don’t keep people just to keep them. It’s not always negative when someone leaves your team. There are positive or neutral reasons why they might want to leave, that don’t mean a burned bridge or a lost member. You want a team where everyone wants to be there and is contributing. Even after downsizing, I still have a lot of stuff. Hey, I like stuff. There are things I hold on to for sentimental reasons. I’m fine with that. But there is a balance to be found between keeping stuff and opening up room for new things. 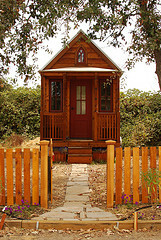 What are some areas in your community where you have downsized? Please tell me in the comments.